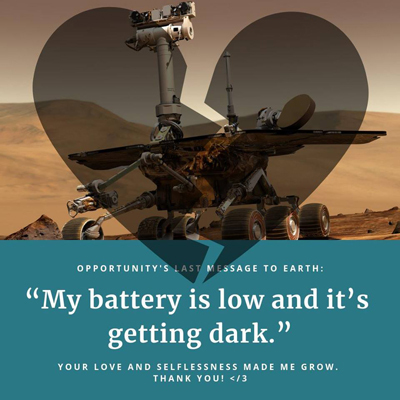 On February 13 2019, NASA announced that Opportunity - a Mars rover launched in 2003 with an intended longevity of three months - was likely to be dead. Is Opportunity actually capable of such advanced communication skills? Is this someone simply trying to anthropomorphise Opportunity's last contact with the Earth? Other answers give good technical answers to what the last message would actually have looked like, but I thought it worth tackling the angle of where the quote came from. Wikipedia cites an article on LAist a Los Angeles local news / blogging site, written by Jacob Margolis. "My battery is low and it's getting dark." That's how I felt when I heard that NASA's Opportunity rover mission was coming to an end after 15 years. That Oppy, the rover, was officially dead, and that it had sent back one last alarming communication to Earth before finding its final resting place in Perseverance Valley on the surface of Mars. People started talking about it as if they were actually the exact last words that the rover said. The NY Daily News reported it as fact. JPL contacted me to let me know that they were being inundated with questions about the final message. And while it seemed like most people understood the context within the tweet, many didn't. As NPR's Scott Simon said, it's a "poetic translation." And then it was Sunday, we actually got a communication from the rover and we were shocked. It basically said we had no power left, and that was the last time we heard from it. It also told us the skies were incredibly dark, to the point where no sunlight gets through. It's night time during the day. In both cases, the "it" seems to refer to the rover, anthropomorphising it; this appears to have been Margolis's inspiration to rephrase the message as a quote in the first person. The dust storm that is affecting Opportunity has greatly intensified. The atmospheric opacity (tau) over the rover has increased to a record 10.8 on Sol 5111 (June 10, 2018). Power levels on the rover have dropped to a record low of ~22 watt hours. As expected, Opportunity has tripped a low-power fault and gone silent. A 72-hour spacecraft emergency was declared on the afternoon of Sol 5111 (June 10, 2018), anticipating the low-power fault. High atmospheric opacity means that the atmosphere is blocking a lot of sunlight, making it dark. Future estimates of atmospheric opacity are far less precise, so we can conclude that the measurement of tau was transmitted from the rover rather than another source. "We are looking at an incredibly small amount of sunlight – .002 percent of the normal sunlight that we would expect to see," Bill Nelson from NASA’s Jet Propulsion Laboratory (JPL), chief of the Opportunity mission’s engineering team, told Mashable. "If you were there, it would be late twilight. Your human eye would still be able to make out some features, but it would be very dark." The darkness and record low battery are consistent with the claim. 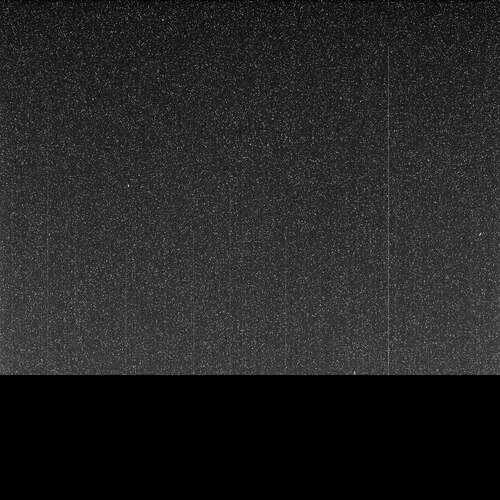 The last image sent by opportunity was static and blackness. The filename indicates it was taken at 4:24 PM UTC. Opportunity definitely transmitted the information in the claim on its last day. I do not know if it transmitted anything else in a separate transmission afterwards. It most certainly did not transmit a plain English message ready to be memed, but rather a technical status update that NASA's bloggers interpreted for us, and then was reinterpreted into the meme. As a personal note, if I am on my deathbed and I say something meaningful and wise, and then I follow it up with a mundane comment right before I die, please remember the wise thing as my last words. Opportunity does not literally speak English, so no such message was expressed in those terms. However, Opportunity did communicate the information that it had a low battery and it was dark outside. The rover's flight software outputs a variety of data formats (summarized in this paper) ranging from "event reports" to telemetry to binary data produced by the spacecraft's subsystems (including imagery from cameras and other research products). The result of all of that is downlinked to earth and then processed on the ground by different teams into human-readable output. While there is a great deal of public data available for download, I don't believe this applies to the raw transmissions from the rover, but you can see the ACSV format some of the engineering data is processed into. 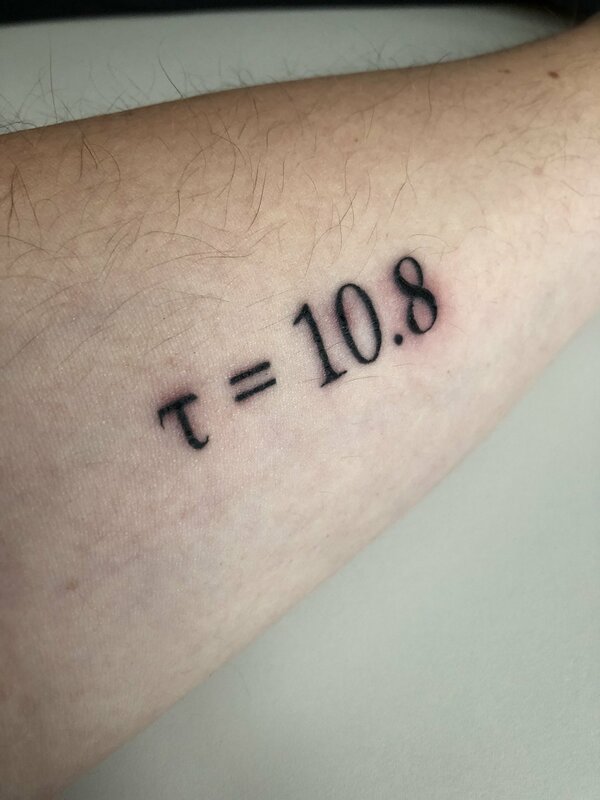 Scientists then process and review that data and write things about it in English, anything from technical reports ("a measured tau of 10.8") to the more poetic "my battery is low, and it’s getting very dark." Overall Assessment Opportunity is currently in the midst of a severe dust storm though all subsystems are still operating as expected in RAM mode as of the Sol 5111 UHF pass. Solar array energy is approximately 22 W-hrs, with a measured tau of 10.8. This Tau measurement is the highest ever recorded from a ground station on the planet Mars. Dust factor was previously estimated at 3.27 as of Sol 5108. With analysis from the data from the Sol 5111 downlink, we expected the rover to enter a low power fault mode very soon after that point in time. Since then, there have been no beeps nor fault windows detected during DSN coverage periods. This behavior is fully in line with array energy expectations, as Opportunity will use deep sleep during such times. We are now waiting for the skies above Opportunity to clear enough for the solar energy to support the fault communications windows (which will send signals to Earth). The team has suspended nominal sequence operations, and we are listening every day for Opportunity to talk to us via one of the fault windows. Thermal predictions carry a positive medium to long term message, whether it takes several sols or several weeks for the storm to weaken and let the sun through. We expect no thermal damage to the batteries or computer systems, and every sol is one closer to summer warmth. Obviously, the team is concerned. But, all of the data and our knowledge indicate that Opportunity is likely to be doing more geological experiments during the upcoming Martian summer, helping unwrap the mysteries of Endeavour crater. Until then, our current mission phase is one of patience and readiness. Opportunity did not drive during this period. As can be shown in this chart, 22 W-hrs is a very low value for energy collected from the solar array as compared to previous periods. At this time, the scientists considered "a low power fault" to be "inevitable" (note though that "There is no danger to the spacecraft going into a low power fault. The only danger is the temperature getting too cold and damaging the battery or the instruments.") The tau value (atmospheric opacity) is the highest ever recorded, so high that the report includes a prominent note alerting readers that it's not a typo. The rover does not calculate this value itself; it takes a picture of the sun through a solar filter, and scientists process that image on the ground to determine the numerical value. In other words, the spacecraft reported data indicating low energy and darkness. This Metro article cites a tweet by Keri Bean, an engineer who worked on the opportunity mission who had Oppy’s final measurement tattooed on her arm. This could then be interpreted to the message in the meme. Not the answer you're looking for? Browse other questions tagged space-flight nasa engineering robotics mars .